31 To cure a Ham - Gt. Fenton Receipt. For a Ham of about 20 pounds - take 1 1/2 lb. Bay Salt - 1/2 lb. common Salt - 2 oz. Saltpetre - and 1 oz. black Pepper - pound them, separately, very fine - Rub the Ham first with the Saltpetre - then with the Bay salt, & pepper - & lastly with the common Salt - Rub it well, four days - Then put upon it 1 1/2 lb. Treacle - & baste it every day for a month, turning it frequently - N.B. Soak a ham in cold water 24 hours, before you boil it. Hotch Potch. 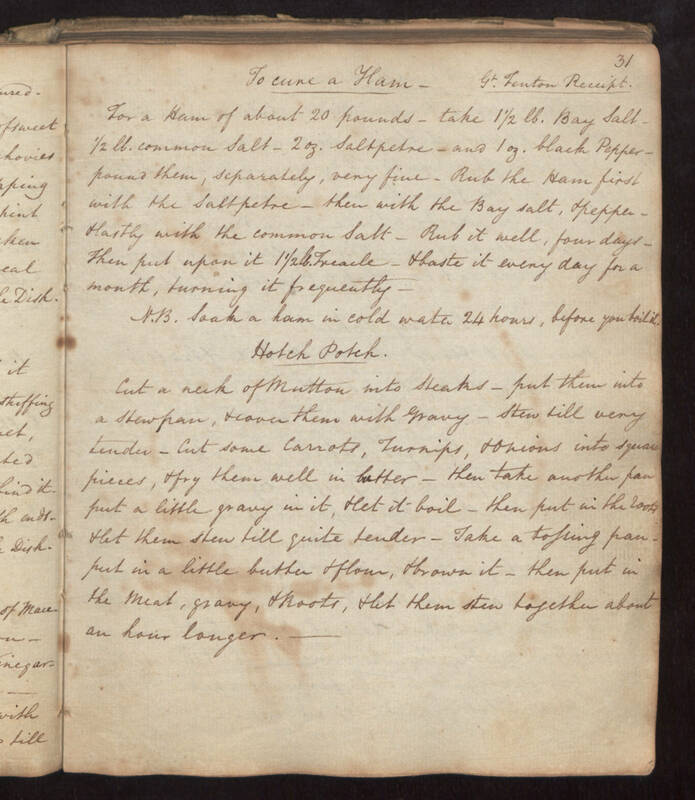 Cut a neck of Mutton into Steaks - put them into a Stewpan, & cover them with Gravy - Stew till very tender - Cut some Carrots, Turnips, & onions into Square pieces, & fry them well in butter - then take another pan put a little gravy in it, & let it boil - then put in the roots & let them stew till quite tender - Take a tossing pan - put in a little butter & flour, & brown it - then put in the Meat, gravy, & Roots, & let them stew together about an hour longer.